MadWalk is one of the largest celebrations of fashion and music in Athens, Greece. For the 6th time Mad organised this great event. As every year, distinguished Greek fashion designers and brands showed their collection with beloved artists in a great scenery combining live performances. In order to unite fashion and music, artist and fashion icon Despina Vandi was the presenter of the evening. 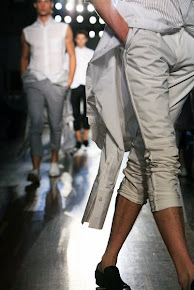 Participating designers are Apostolis Mitropoulis, Celia Kritharioti, Deux Hommes, Dimitris Petrou, Loukia Kyriakou, Mi-Ro, Parthenis and Stelios Koudounaris and fashion brands Axel, BSB, Despina Vandi, MED and Tsakiris Mallas. Performances were by Steven Triantafillis of My excuse & Athina Oikonomakou, Demy, Chirstos Cholidis, Idra Kayne and Thodoris Mavrogiorgis of the Wedding Singers, Evridiki and Anastasios Rammos, Tamta, Onirama, Playmen, Christos Mastoras, Sergey Lazarev, Kostas Martakis and Eleni Foureira. Here a first photo, more coming up!